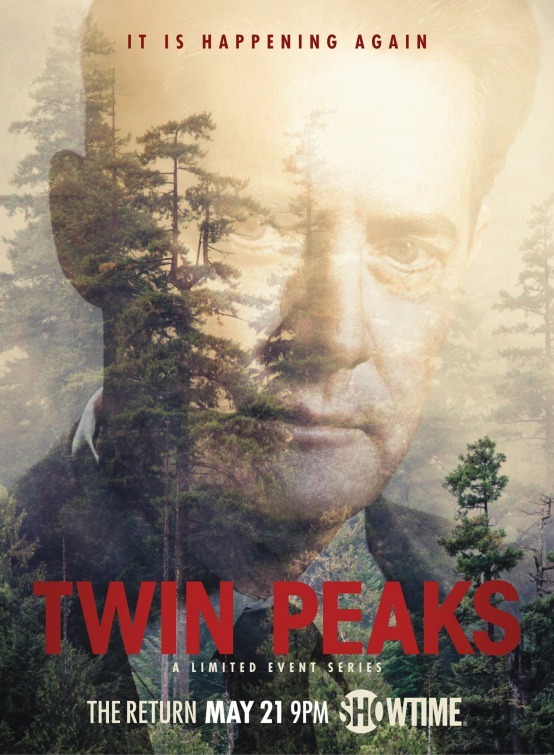 The David Lynch and Mark Frost revival brings back the show without the restrictions of network television as a single 18-hour movie split into chunks and (I’m currently 4 episodes in) all end with a different band performance. Yes, composer Angelo Badalamenti has returned and the nostalgic Twin Peaks theme is intact with a slightly different credit sequence, the mill replaced with the Red Room’s curtains. Doppelganger Cooper (Kyle MacLachlan), must return to the Black Lodge in order for the real FBI agent Dale Cooper to be freed from his 25 year slumber. But things are completed with a third Cooper (also MacLachlan) throw into the mix. While all of this is going on, other events are transpiring in New York guarded building where a mysterious large glass box has sprung to life and killed its watcher. In South Dakota, a severed head and a headless body have been found and all the various narrative threads have yet to come together in any fully coherent matter. Off the top of my head the majority of the cast return, those actors who have since passed on even show up as manipulated archive footage, notably Major Garland Briggs (Don S. Davis) floating head, David Bowie’s Philip Jeffries’ character is mentioned. Who knows who else will turn up. Some have passed on since filming the latest series and are acknowledged in the credits including the posthumous appearance of Catherine Coulson’s The Log Lady and Miguel Ferrer, who played Albert Rosenfeld. Those who don’t return have simply fallen out with Lynch and their reasons are well documented in the press. Lynch has created something just as fascinating as the various directed predecessor and what is most striking is that quirky tone of the old series is recreated without merely forcefully copying it (as the recent X-files tried too hard to do). Lynch is on form here and it’s just as weird as ever. The mix of crime thriller with elements of surrealism, odd humour, soap opera outlandish off beat acting and supernatural horror is as effective as ever. If you’re left flummoxed – that’s the fun, because you’re probably meant to be. Twin Peaks helped shape much of the modern television landscape and this latest addition is great looking with surprises, thrills and chills – season 3 is an artsy must see. On the far side of the galaxy the colony spaceship USCSS Covenant takes a detour and discovers horrors on an uncharted planet. Opening with a flashback of David being activated by Peter Weyland we are treated to an Alien-style title sequence. After a shocking neutrino burst opening we are then introduced to the characters brought abruptly out of hyper-sleep by Walter a synthetic model. Soon the crew land on a planet and after a series of hostile events meet David, a survivor of the Prometheus mission. David and Walter (Michael Fassbender in dual roles) are put centre stage. To Ridley Scott’s special effects team credit the androids are exceptional and you never question the illusion of the two characters being on screen at once. Whereas Prometheus felt somewhat innovative and charted a different direction to the Alien series if you are a fan be warned, Covenant takes a step back with the Engineers and Shaw’s story thread ending abruptly. Aside from Guy Pearce’s Weyland’s cameo, ties from Prometheus are broken and even Noomi Rapace’s Shaw who appeared in Covenant’s promotions is substantially cut in the final film. This is in place of a standard three act Alien affair, without the suspense of Alien but all the brashness of Aliens, still director Scott’s moody, thoughtful style shines here. Naturally the aesthetics, cinematography, production design are of Scott’s high standards and Covenant moves at breakneck speed, from ship, to planet, back to ship à la Alien format borrowing also from Aliens and his own Prometheus and even a line from Blade Runner. In addition, Jed Kurzel’s soundtrack takes all the best cues from Jerry Goldsmith’s 1979 Alien score and hones a reminiscent hybrid of sorts. Lead Katherine Waterston’s Daniels (terrible hair cut aside), does her best with what she’s given. James Franco appears briefly and like Rapace his part aside from body and video footage is left promo material hell. Waterston offers enough emotion to keep Franco’s Branson spirit alive throughout and you buy into her loss. Logical straight talking Callie Hernandez’s Upworth is notable along with Billy Crudup’s to the book Oram and Demián Bichir’s tough solider Lope is memorable. Fassbender’s dual performance is excellent. However, he unjustly steals the show and his position of prominence takes away what made (certainly David) so interesting as a secondary character in Covenant’s predecessor. 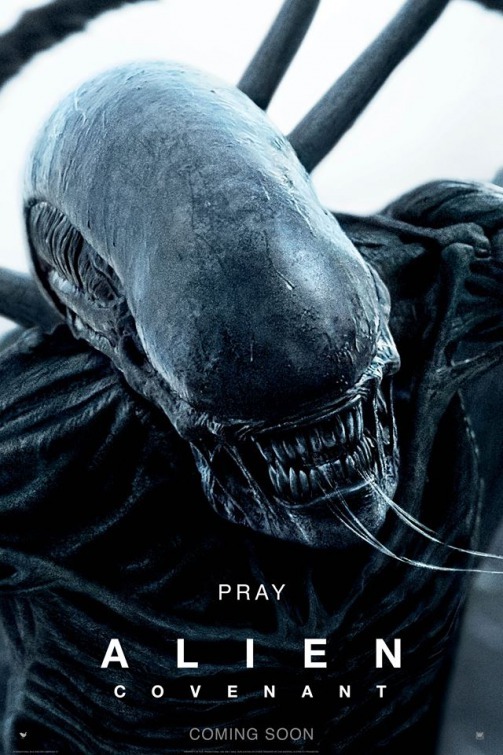 When things go pear shaped there’s plenty of blood and gore, the alien eggs, Chestburster and Facehuggers are finely tuned for screen, Scott also throws in fighting androids and Aliens-like shoot outs – there’s plenty to like about Covenant. Waterston along with Danny McBride’s pilot Tennessee look comfortable going head to head with the pesky Alien, even if it all feels somewhat rehashed and rushed. However, die-hard Alien fan’s will have to buy into facehugger embryos (?! ), David creating eggs and incubation times. This is topped of by handful of writers who offer a frustrating ending which teases another follow up. Overall, Scott plays it safe and delivers a sci-fi horror with a typical series of action setups that is basically there to appease action fans rather than create suspense which was the originals finest quality.